When I think of summer, I think of barbecues and picnics surrounded by family, friends and the freshest foods the season can deliver. Nothing is more delicious on a hot summer day than a nice juicy slice of watermelon. As much as I love ice cream and would like to eat it everyday it’s just not a good idea. 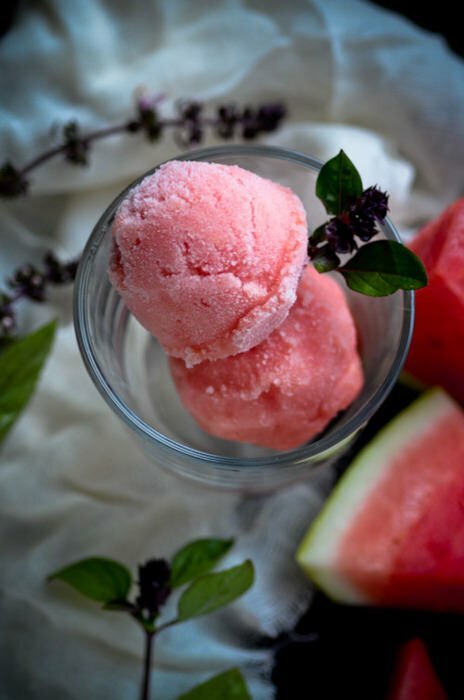 This sorbet is a great alternative for when you want something that feels decadent but is a little lighter and healthier. I really don’t miss anything when I eat this, it’s cold, herbal, sweet and utterly refreshing. 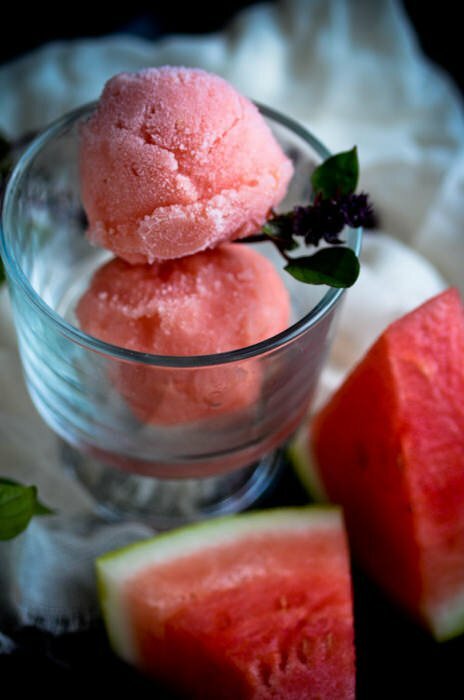 This time of year the farmers market is full of all kinds of delicious varieties of melons and I can’t wait to try a few different varieties in this sorbet. 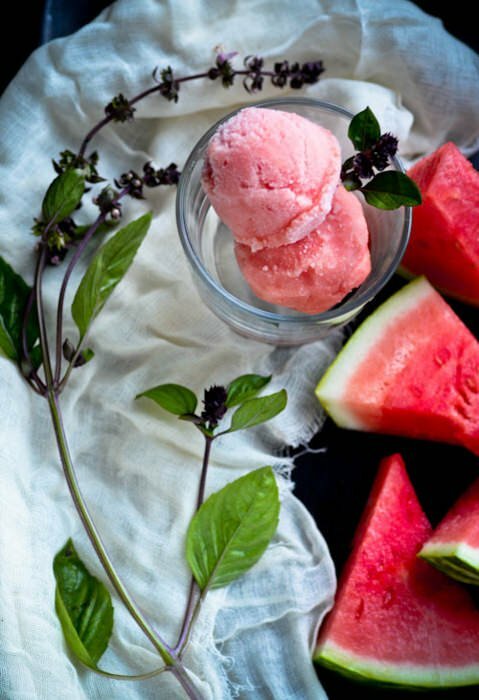 Experiment with the flavors, cantelope and mint would be delicious. I didn’t have any in the house but don’t be afraid to add a tablespoon of your favorite alcohol to the mix, it will keep the mixture from freezing solid. In a small saucepan, bring sugar, corn syrup, lime juice and basil to a boil until the sugar is dissolved. Let cool slightly and allow the basil to infuse the mixture. Cut the ring off the watermelon and cut into cubes. Puree the mixture in a blender then strain through a fine mesh strainer. Remove the basil from the syrup and add to the melon puree, stir until combined. 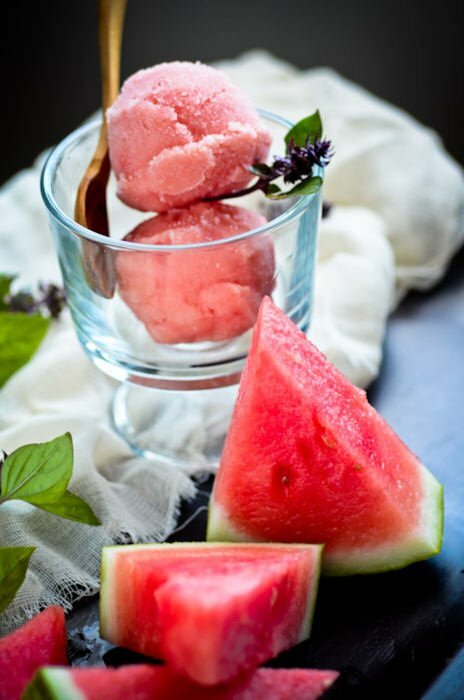 Freeze the sorbet in a ice cream maker for 15-20 minutes or alternatively just place the mixture in the freezer for 3-4 hours stirring every hour to break up the mixture.